We better get busy with the menu before more Spring Breakers arrive and I have a feeling we are going to have a fish fry. Mix 2 1/2 cups flour with the sugar, salt and yeast. Add the hot water and butter. Mix until the dough becomes sticky add more flour from the reserved cup until the dough has come together. Knead the dough for about 4 minutes. Spread the dressing all over the dough, then layer on the corned beef, cheese and the sauerkraut. Seal the ends and then bring the sides up until they meet. Cover the Pockets and let them rise in a warm place for 30 to 45 minutes. I sure hope that you enjoy your Ruben Hot Pockets. My bunch of Spring Breakers are just coming in with a stringer of fish...can't wait for the Fish Fry. You have a great week and hope to see you at Full Plate Thursday. Spring break! Sounds like fun. These pockets are incredible! The picture of that Irish Cottage Pie looks awesome! I'm not a sour kraut fan but I'll bet the reubens turn out well! Enjoy your Spring Breakers this week! I know you will all have a blast! I love Reuben sandwich, but I've never had the Reuben pockets. I have really been missing out on even a better version of the Reuben. Your brad pockets look insanely delicious and inviting. Thanks for sharing the recipe, Miz Helen...if only I could make it as half as good as yours, I would still be happy! I love Reubens in all forms. The hot pockets sound delicious! I love Reuben sandwiches and these are making my mouth water! I must try them! What a great way to serve a Reuben - especially to kids! Sounds like you will have a housefull of spring breakers - and they will be eating like kings! Thanks for sharing this with us at the Hearth and Soul Hop! 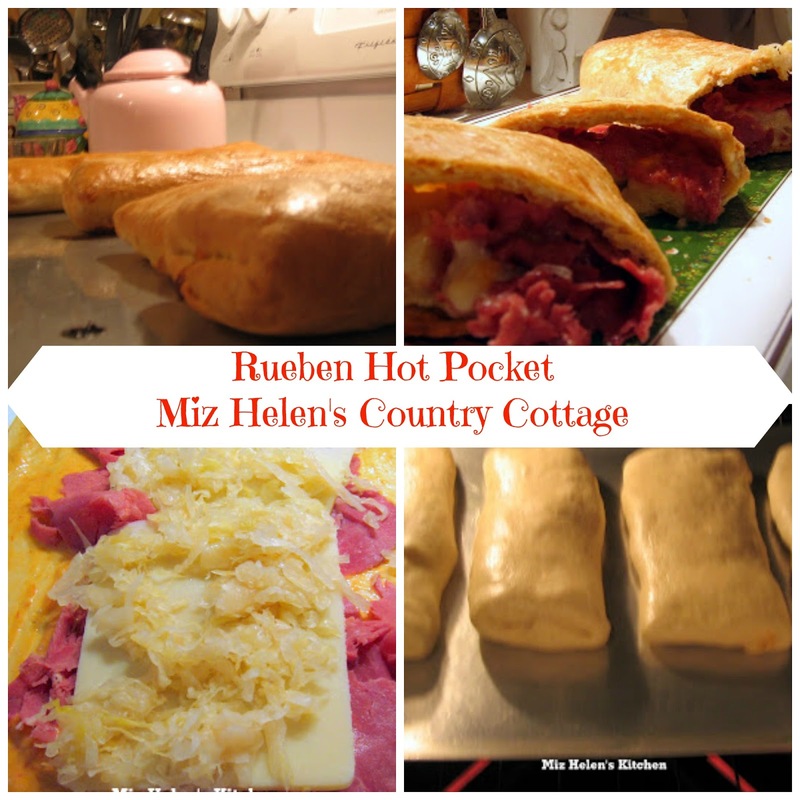 Your menu sounds fantastic, and those Reuben hot pockets - oh my! Thank you for the recipe!! Enjoy Spring Break! Looks delicious! Love all the ingredients, I must admit, I have a weakness for Thousand Island dressing, I just love it! Thanks for sharing, Miz Helen. Those look so yummy and fun!! Love Reuben's, looks delicious as a hot pocket! Sounds like good eating at your house for the Spring Breakers! These sounds so amazing! I love Reuben's and always make them with my St Patty's Day leftovers, but this takes it to a whole new level! Mmm, that sounds good. Thanks for sharing. Thanks for linking this to What's On the Menu Wednesday at Dining With Debbie. I love all of the flavors in these so I know I will be giving this a try soon. I used to make a Reuben in the Round quite often, but I have not done so in some time. With just the two of us, I need to adapt that recipe. homemade hot pockets are such a great idea---and filled with corned beef to boot! how yummy! thank you for sharing with tuesday night supper club.